Event organizers say "to change everything, we need everyone." Nassau County, NY - September 21, 2014 - The People's Climate March is happening this Sunday, September 21. The march is to raise awareness about the climate crisis in the world. In Nassau County, a dedicated group of volunteers, lead by Bob Young of Merrick, and Dan Lamparter of Long Beach, are organizing and sharing the message directly with the people. 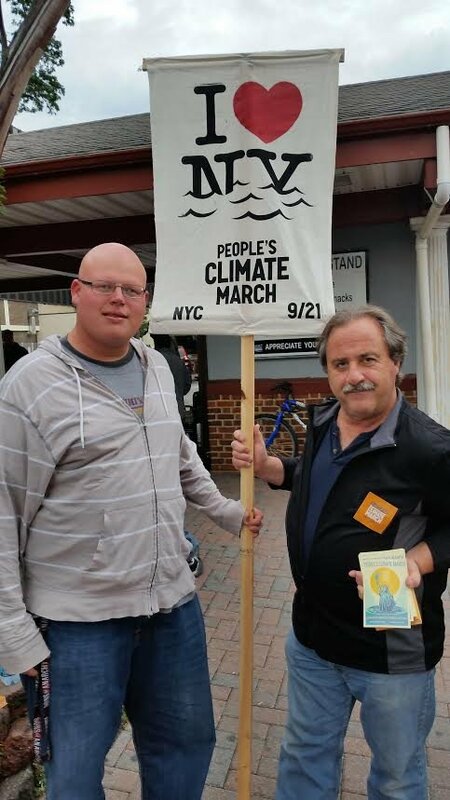 Young and Lamparter started a group called, the Nassau County People's Climate March NOW. The group is made up of Nassau County residents from from Bayville to Seaford, and everything in-between. They are attempting to reach thousands of Long Islanders in hopes more residents will participate in Sunday's march. They created a Facebook page, are distributing fliers, and calling friends in the hopes that Nassau County is properly represented in the march. "As a lifelong resident of Long Beach, I saw first had the destruction of Super Storm Sandy. People lost their homes, local business were devastated, my family and I were displaced for months, as were many of my friends and neighbors. Climate change is real, and this march is important to raise awareness of how local Long Islanders are being impacted. We need people to like us on Facebook, and join with us on Sunday, September 21,” stated Lamparter. People from across the nation will be participating in the march, and it is expected to gain international attention. "I am out on the streets with an invitation to change everything. World leaders will be in New York City for a United Nations (UN) summit on the climate crisis. UN Secretary­ General Ban Ki-­moon is urging governments to support an ambitious global agreement to dramatically reduce global warming pollution. On Sunday, Nassau County residents have an opportunity to demand a world with an economy that works for people and the planet. To demand a world safe from the ravages of climate change, a world with good jobs, clean air and water. We as a people have our future on the line and the whole world watching. To change everything, we need everyone, join with us at the march,” stated Young. The march begins at 11:30am and it will line up along Central Park West, from 61st street up to 86th street. Residents interested in marching are encouraged to email Bob or Dan at nassaucountypeoplesclimate@gmail.com or message them on the Facebook page. Photo by Matthe S. Hynes. Subject: LongIsland.com - Your Name sent you Article details of "Nassau Residents Support the People's Climate March"